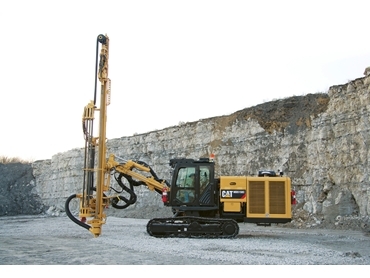 Caterpillar has launched the new MD5150C track drill, the first in its C series drills. According to Cat this new machine builds on the existing MD5150 drill with more Cat components and a choice of three different rock drills. The new drill has a higher airflow for faster, more efficient drilling of holes from 101.6 millimetres to 152 millimetres in diameter, as well as a patented carousel rod changer, and a more ergonomic cab. "Compared to the MD5125, which the MD5150C will replace, the new drill has 18 percent more power, a compressor that can deliver 33 percent more air volume and 40 percent more air pressure, 19 percent faster tram speed and 40 percent greater ground clearance," Cat said in a statement. The machine has been designed with fewer moving parts than competitor drills, with the rigs designed to be serviced on site. "Service doesn’t require a clean room, and there’s no need to incur freight costs to ship the rock drill to the OEM for maintenance or to keep a spare rock drill in stock to accommodate maintenance downtime," Cat said. The rig also features an automated lubrication system, which cuts downtimes as the rock drill now no longer needs to be stopped regularly for manual greasing. The three options for rock drills allows operators to use the right drill for the right application. The standard rock drill on the MD5150C is the HPR5128, which uses 51 millimetre drill steel. Also available are the HPR6832 Rock Drill, which can use 68 millimetre speed rod, and the HPR6030 designed for 60 millimetre drill steel. An innovative carousel rod changer also cuts downtimes. The system holds six rods and accommodates two lengths and multiple diameters of drill steel. Dual rod grippers and a unique gate designs let the rod and gate move simultaneously, reducing overall cycle times. The rod change is supported by a heavy duty 2.7 metre boom that extends to 3.3 metres for larger pattern coverage with fewer setups. "Because the carousel rod changer weighs less and holds more rods than linear models, the boom extension can reach farther and drill deeper while maintaining stability," Cat said. Holes can be drilled within 610 millimetres of the highwall which is 50 per cent close than with a linear rod changer. It has the ability to drill to depths of 31 metres. It has increased airflow for drilling, and is powered by a Cat C11 engine rated at 287kW at 1800 rpm. The cabin has been designed for safer operation, and is both ROPS and FOPS certified. It has shutdown controls accessible from the ground, with large windows, streamlined front structures and a skylight to enhance visibility. The cab also has low sounds levels of around 80dB. Increasing efficiency, it is fitted with "a smart drill monitoring system that tracks changes in rock formation and automatically adjusts impact and feed pressure based on hardness of the rock. Anti-jam, anti-plunge and anti-plug capabilities keep the track drill working efficiently and extend drill string life," Caterpillar explained.